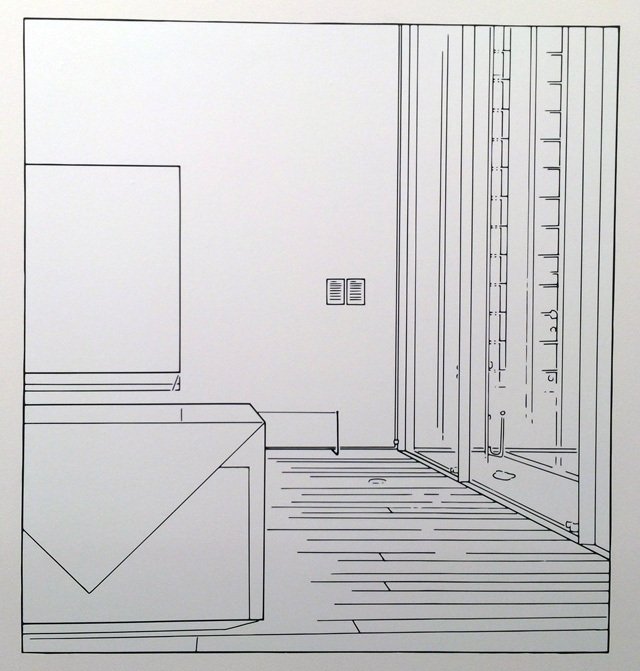 At the core of artist Louise Lawler’s work is the question of place, by which I don’t mean simply a notion of geography, but also hierarchies. She often steps back from creating substantial physical objects, instead preferring documentation that offers a window — and more importantly, distance — so that the viewer can reflect on cultural and economic value systems that prop up the art object. 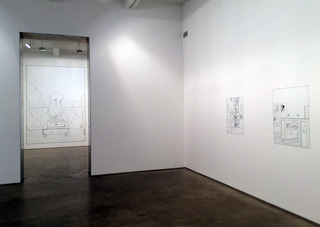 Lawler’s current exhibition at Metro Pictures, No Drones, continues that conceptual tradition but takes it one step further by paring her own established body of work and shedding layers that have traditionally made the images more aesthetically pleasing, including color, texture, and light. All we’re left with is a cold black line. The works themselves were created by an illustrator, who was hired by the artist to trace her more famous photographs. The result is underwhelming and decorative, flattened patterns that do little to excite the imagination, but at their large scale they’re strangely alluring in the language of commercial display. Gone is any obvious social critique, the fixation on status that normally inhabits her work, and we’re left with an idea that’s been seemingly automated into merchandise (there’s even a coloring book). No one buying this work would do so without the aura of her previous art. That point furthers her longstanding critique of the systems of value in art, and their tendency to perpetuate with no self-criticality. Unlike her photographic series of masterpieces in collector homes or galleries, which made her famous, these vinyl works offer a sense of nostalgia for the conventional domesticity that permeates the original images. Lawler is creating art for insiders who are fluent in the references and may be looking for new perspectives on the familiar — yet ultimately there’s little visual revelation here. One of her most famous images, “Pollock and Tureen” (1984), shows a fragment of a painting by Jackson Pollock above an antique soup tureen. In the photograph, the color relationships are clear, offering insight into the choices of the collectors who “arranged” (a favorite word of Lawler’s) the scene. 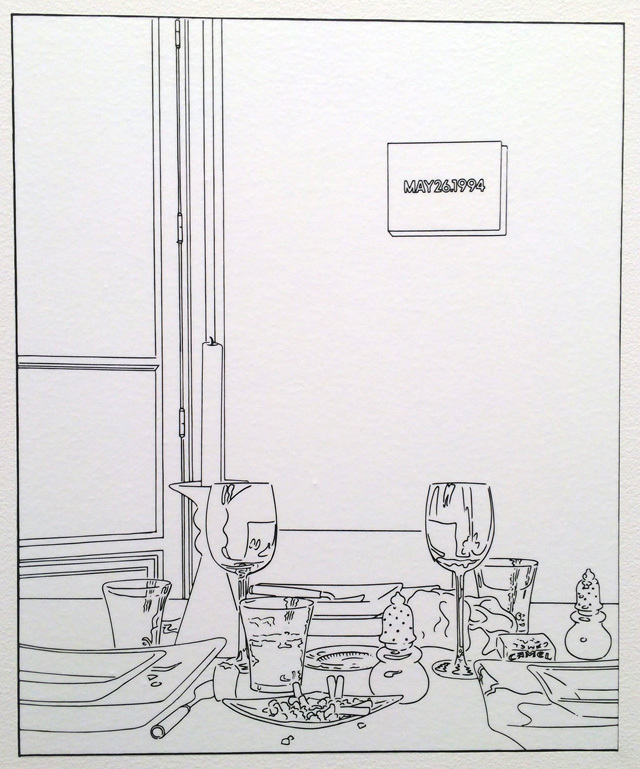 The work is about class, capitalism, and domesticity, not to mention reality and fiction. But when all the site-specific context is removed, as it is at Metro Pictures, all we’re left with is contemplating the original Lawler artwork’s role in art history and the market. 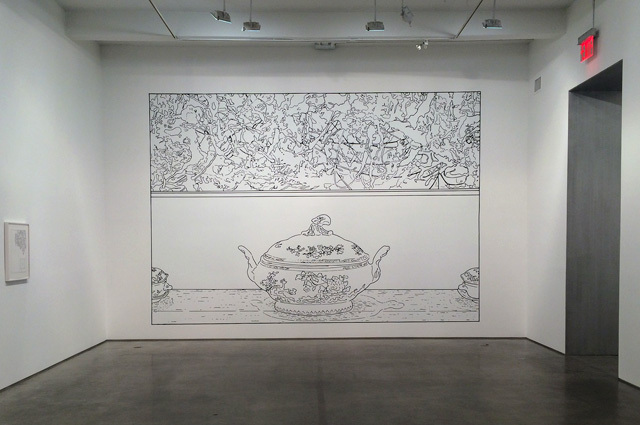 Louise Lawler’s “Pollock and Tureen” (1984) has been transformed into a colorless linear drawing on vinyl, “Pollock and Tureen (traced)” (1984/2013). Carving away at the elusive promise embedded in each art object is something Lawler does expertly, and here the final product is more hollow than ever before. 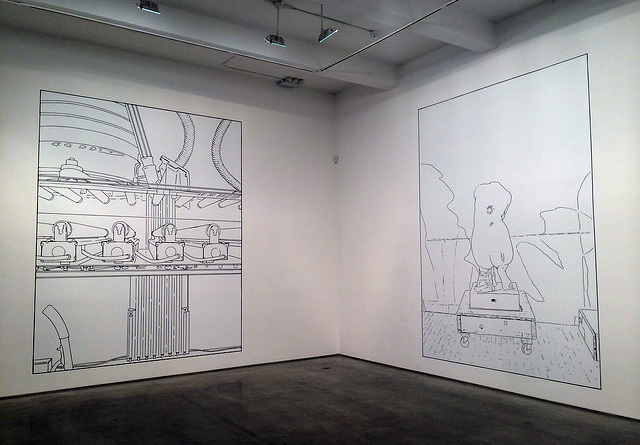 Louise Lawler’s No Drones continues at Metro Pictures (519 West 24th Street, Chelsea, Manhattan) until July 25.